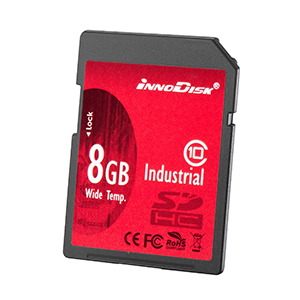 The Innodisk Industrial SD card is a slim, SLC-based storage solution designed for portable devices. With a built-in ECC function, it can help detect and correct errors during data transfer. It is also compatible with SD 1.1 and SD 2.0 standards, and supports SDHC Class 10 and SPI modes. Innodisk’s Industrial SD card consumes little power and is available in capacities ranging from 128MB to 16GB.